For some reason, I am really, really allergic to just about everything you put on your skin. I can’t use lotion, insect repellent, underarm deodorant, or sunscreen without really bad allergic reactions. As a result, during the summer while everyone else is at the beach, in the woods, or playing summer sports, I’m usually cowering under the bed. I’ve tried so hard over the years to find products I can use. Even ones that are marked “natural” have caused horrible reactions. My body is clearly trying to tell me something each time I try one of these things. Even if you’re not allergic to these things, have you ever thought about what goes in them? Here are the words from a label of popular underarm deodorant. Now believe it or not, most of these ingredients probably are harmless, but that first one (which is the active ingredient in most of the major anti-perspirants) isn’t good news. 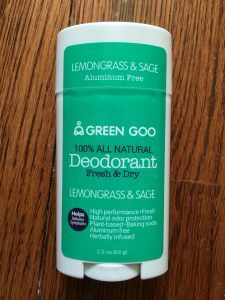 The way this ingredient works, aluminum (yes, the same Al found in your Reynolds Wrap) and zirconium ions absorb into your skin, cause your skin cells to swell, and then pinch the sweat glands closed, keeping them from releasing sweat (ergo the word “antiperspirant”) and also absorbing odor. It’s truly a miracle of modern science, but just a bit creepy when you look into the details. Your body is obviously trying to do something very natural in expelling perspiration, and yet you’re blocking your body from doing so. Even though scientists say that there’s no harm in these chemicals, there’s just something downright unnatural about keeping your body from expelling sweat (and the toxins that go with it). Now don’t get me wrong, I’m not one of those “natural living” warriors who’s out to destroy all the pharmaceutical companies and bring us back to an age where no one uses chemicals and everyone’s got dry skin that’s getting attacked by mosquitoes–at least the ones who who aren’t repelled by the terrible odor emanating from you. On the other hand, it’s difficult to deny that we have way, way too many unnatural chemicals in our lives today, from the food and drinks we ingest, to the topical ointments we put on our bodies. I had to do a bit of a double-take when I read the ingredient list. It sounds more like a healthy smoothie than a stick deodorant. And there’s no ingredient that’s more than three syllables long! How does it work? We had a heat advisory in my town this morning, with temperatures up to 93 degrees and humidity at 87 degrees. I applied some of the stuff earlier today to clean armpits (just one or two swipes, following the directions). 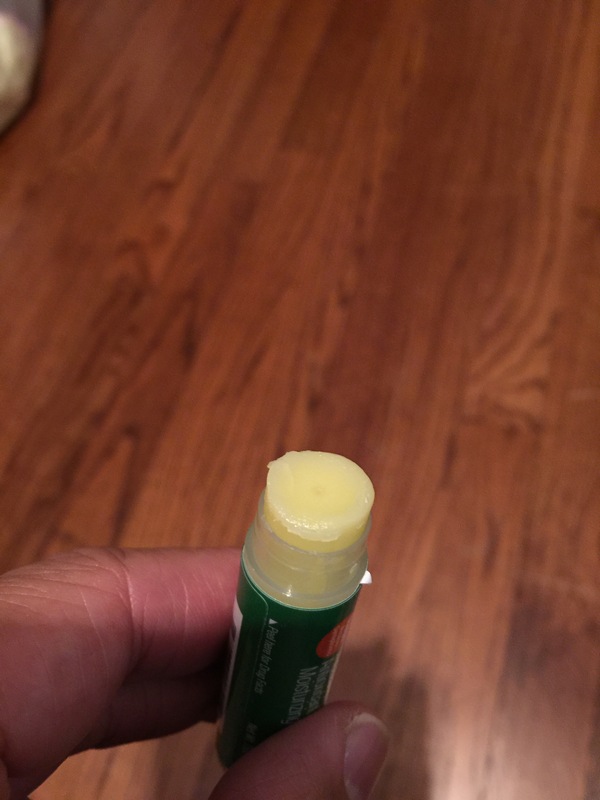 It felt dry and a little flaky when I first touched it, but when I applied it it went on smoothly. 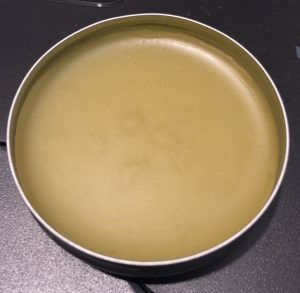 The stuff smells absolutely wonderful–the cap says that it’s “Lemongrass and Sage”, but the aroma is amazingly fresh and delicately balanced between the flowers and the citrus and herb essential oils. It’s not overpowering like perfume or cologne. Just now I just got back in after a long, grueling walk trying to catch Pokemons. While the deodorant didn’t stop me from sweating, it did cover much of the odor. and best thing of all, unlike with other deodorant sticks, I’m not breaking out into itchy rashes and hives. In fact, I feel great. 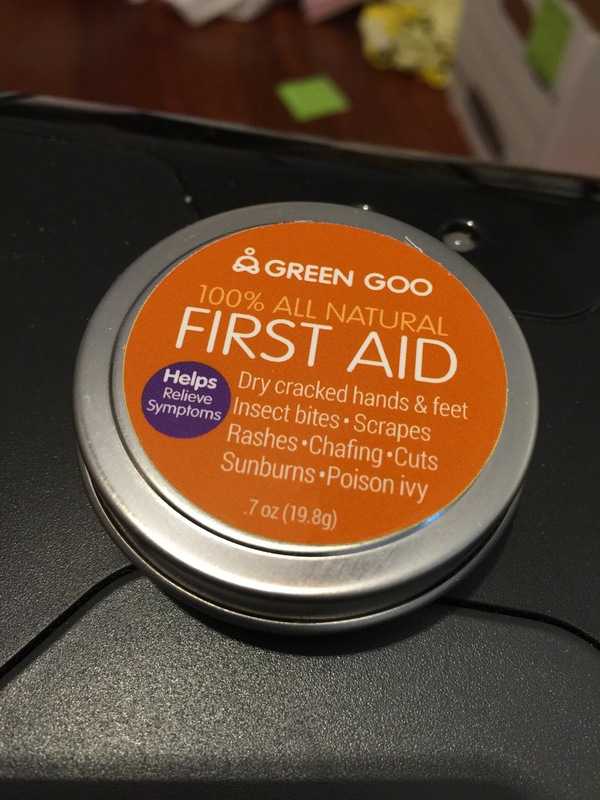 The next GreenGoo product I took a look at was their First Aid ointment/salve. Their company slogan is “rethinking First Aid”, so I’m guessing this is one of their signature products. It comes in a package like this. Opening the box reveals a tin. And inside the tin is the eponymous “green goo”. Again, after dipping my finger I was tempted to taste it, as the aroma of lavender and rosemary was heavenly. The combination of herbs reads like a time-tested list of herbal medicine. I know a lot of people scoff when they hear the words “herbal medicine”, but remember that ALL medicine was “herbal” until the first synthetic drugs were introduced in the 20th century (in fact, pharmaceutical companies like Merck, Abbott Laboratories, Eli Lilly, Hoffman-La Roche, and parts of Glaxo Smith Kline, and Pfizer all started as small apothecary shops in the 1800s distributing botanical drugs). In other words, this isn’t snake oil, but a combination of truly natural ingredients that have been used to treat various ailments since ancient times. Does it work? It was an interesting feeling–the surface was smooth and solid, but after putting my finger in it it sort of “melted” into my finger. It definitely felt soothing putting it on my burn. 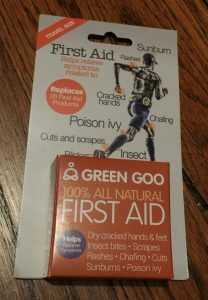 And according to their Web site, it helps relieve symptoms not just of burns, but also of insect bites, cuts and scrapes, cracked hands, poison ivy, cold sores, sunburn, chapped lips, blisters, ingrown toenails, fungal infection, and chafing. The combination of herbs doesn’t just cover the wound, but actually has antibacterial and antiseptic qualities. It’s completely safe for children, and they even have a version for pets. 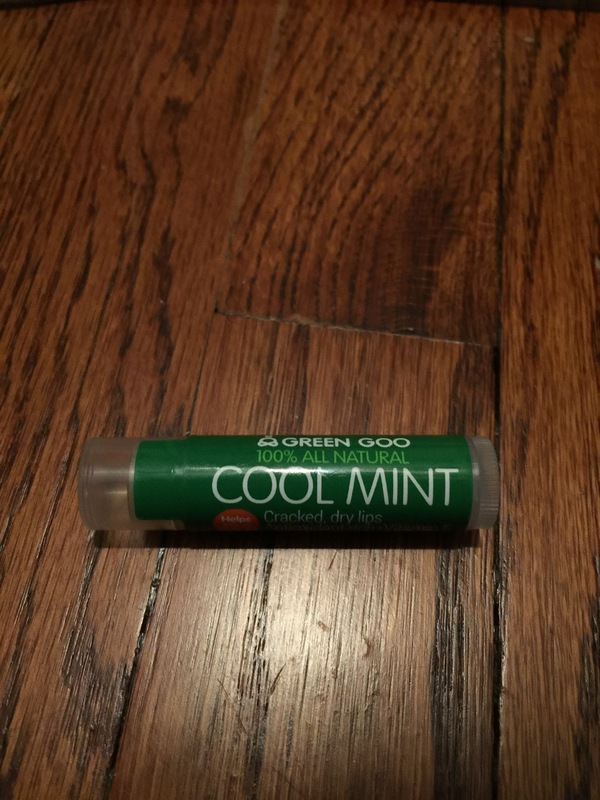 Finally, I got to try out their lip balm, in the Cool Mint variety. 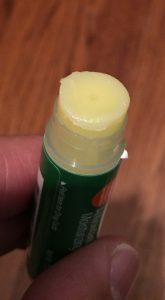 The tube looks like any other lip balm. But the contents don’t feel anything like any lip balm I’ve tried at all (and I’ve tried all of them–Chapstick, Blistex, Softlips, EOS, and a gazillion others that I’ve bought when I find myself with chapped lips but lost my lip balm, which seems to be a regular occurrence). Some of those lap balms feel like you’re applying a candle to your lips. Others are way too gooey and messy. The Green Goo lip balm was..stunning. Like I said, I’ve tried them all, and this one surpassed them all. When you apply it, it goes on amazingly smooth and silky–you can feel the moisturizing effect almost immediately. But the best part is, a few seconds later you feel the “whoosh” of the cool mint cooling your lips. And this isn’t just from a chemist who concocted a “natural flavor”–this is the real deal. The ingredient list again is remarkable. There you have it–three products that work, that are actually good for you, and are good for the planet to boot. I admit, I was a bit skeptical when I first heard about this company’s products, but I’m a believer. 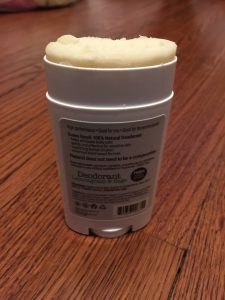 In fact, I’ve been looking for this company for my whole life–I must have tried 7 different brands of deodorant, and 5 different brands of lotion, each which caused bad allergic skin reactions that required me seeing a dermatologist. 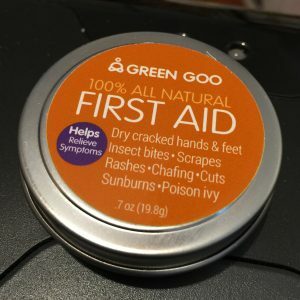 I can’t wait to try out their SPF 30 sunscreen (I love the name of it, which is “Solar Goo”), their dry skin care for dry cracked hands and feet, and their bug repellant. The more I looked into Sierra Sage, the more impressed I was. They’re a family-owned operated business in Lyons, Colorado. All their products are made with certified organic herbs and pure grade essential oils. Their packaging is environmentally friendly, they use sustainable practices, and because their products are natural they won’t cause pollution or danger to nature. And best of all, they are big supporters of some amazing causes. They are big supporters of World Vision, a great charity we’ve highlighted many times in the past. They support the troops through Snowball Express, serving the children of our fallen military heroes. They donate a portion of their great mother and baby products to St. Jude’s Children’s Hospital. Great products, great causes. Green Goo products are available on Amazon as well as on Sierra Sage Organics’ own site. Check them out for yourself. I adore Sierra Sage and all of the products I have tried and now use on a daily basis. Absolutely thrilled they are making deodorant now. I just bought one of each for my family and I to try. The Arnica helps my chronically painful arthritic neck. The lip balms are amazing. The Bug Be Gone actually works to help my daughter keep those pesky mosquitos away from her hyper-sensitive skin. 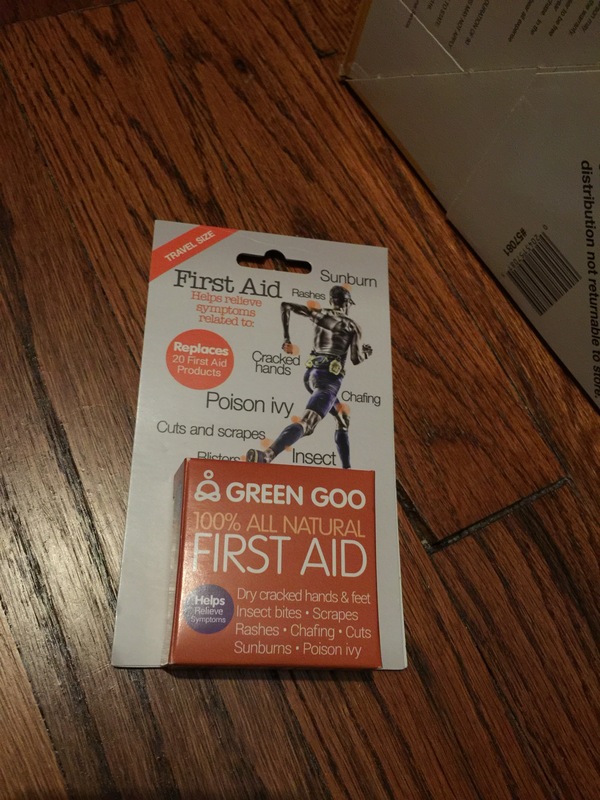 And if she doesn’t apply it fast enough, the original Green Goo takes the itchiness and swelling out of the bite. LOVE THEM!!!! !